A dog is not only an essential addition to a family but can also teach a child responsibility and introduce them to a hobby for life. Children often want to own a dog and in the right circumstances this is a good idea. Firstly the dog should be chosen with care, not too large and of a good temperament.From the first day the puppy arrives in the home give the child his own duties to perform for the dog. This may be ensuring it always has clean water and is brushed thoroughly. As the child grows in confidence he should be able to exercise the dog and make sure that any dog waste is picked up. Hygiene should be taught when picking up after a dog and the child should also be supervised when out walking the dog in public places. All puppies should be trained to obey simple commands and a further step after this is to attend a training class. This may be in obedience or even ring craft if the family is interested in showing their dog. Children are welcome at these training classes and are encouraged to handle the dog themselves. Many clubs have match nights and inter club competitions. This is an ideal opportunity for the child to compete with his dog and to get a taste for competition. The child will learn good sportsmanship and how to lose without throwing a tantrum. Gradually the lure of the competition ring will beckon and you will be interested in larger competitions. Attending open shows with your dog you will find classes for Junior handling alongside normal breed, agility and obedience events. A child may also compete in the show ring up against adults where it is the dog that is judged and not the handler – although the handler will have to perform in a professional manner. Any child attending an event licensed by the Kennel Club is expected to be of good behaviour. The organising clubs expect any parent bringing children to the event to supervise them at all times. Club members can be warned or even banned if their children are unruly and undisciplined. The Kennel Club has a separate division that caters just for the younger dog fancier. 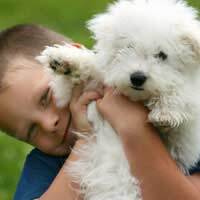 From the age of six a child can join and become part of many exciting canine experiences, learning dog management and responsibility and all aspects of the dog world. Activity weekends, competing for showing and handling awards, heelwork to music, gundog, field trials, flyball and working tests are only some of the experiences on offer. Children play a big part at Crufts and can be seen participating in every event. Many of the events in the smaller arenas are there not just to educate and amuse adults but are for the benefit of children as well. The Kennel Club is very aware of a child’s protection and has strict guidelines for adults who organise any canine event where children will be participating. These guidelines and much more can be found on their website. A dog is not just a pet for the home; if children love their dogs there is a world of opportunity to advance their interest in the canine world.